NTR Trust is committed to give quality education and financial assistance for meritorious girl students. To identify the beneficiaries NTR Trust is conducting GEST-2019. Girls appearing for X standard Board exams in March – 2019 from AP & TS. Just follow the below steps to apply for the NTRT GEST 2019. Step 1 : Go to the official website of NTR Trust provided above. 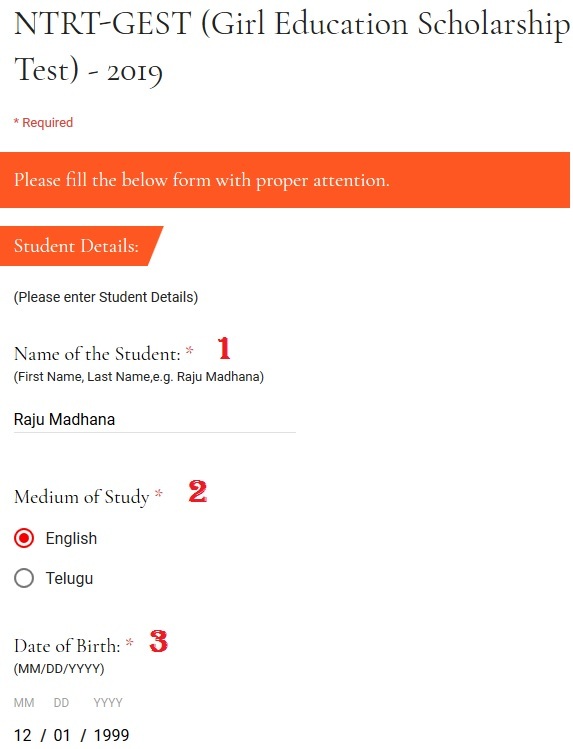 Step 2 : Then click on the “Enroll for NTRT GEST-2019” link in the home page. Date & Time : 09-12-2018, 10:00 am to 12:00 noon. Objective Type (Multiple Choice questions), Max. Marks: 100, Duration: 2 Hours, Question paper will be in English medium of 10th standard only. ** Students must carry Black ballpoint pen & Writing pad for the Exam to mark the answers on OMR Sheet. ** Candidates can download their Hall Tickets with their registered mobile number on 07-12-2018 from 10:00 am onwards. Bring Your Hall Tickets duly affixed with recent photograph. Please bring your photo id proof like VOTER ID/AADHAR/PAN/RATION CARD/DRIVING LICENCE. Total 25 students will receive the merit scholarship to pursue their intermediate in NTR Junior College for Girls, Hyderabad for two years in MPC, MEC & CEC in English Medium. Out of 25 selected Girl students, First 10 Girl students will get a monthly scholarship of Rs. 5,000/- and other 15 Girl students will able to get a monthly scholarship of Rs. 3,000/-. List of selected candidates will be placed in official website within one week from the date of examination. Since 1997, NTR Trust has endeavored to improving the health and health outcomes of the needy groups, meeting the educational needs of underprivileged students, advancing the concept of entrepreneurship and self-employment, and offering support and relief during disasters. We are deeply committed to fulfill every expectation of hope, support, leadership, and coordination. I had given GEST 2019. When can I get the result of the above exam?